wow. I wish i lived in one of those! That be a great place to hide out! You never realized that you lived a BLOCK AWAY from them? YOU, Ananka, the girl detective? Ha. It was before my girl detective days--back when I was just an honest civilian. That just goes to show that hidden things are all around us right under our noses! 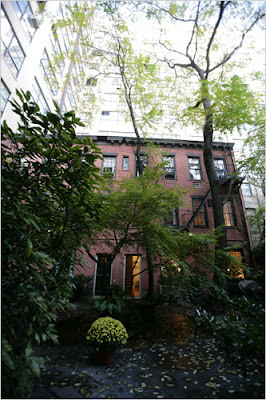 You should find out waht kind of neighbors live there, they might be as secretive as the house! Tsk, tsk...you live just a BLOCK away?! PS: By the way, I'm the one who's been messaging you on facebook, as Jin Ai-I asked about Naomi being the lock picker! You know you can probably still cut and paste that article from the Times online. 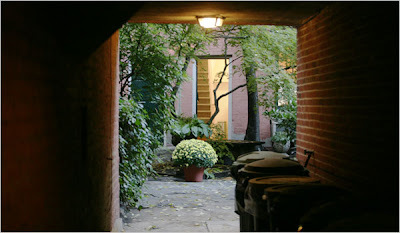 There's also a pretty cool hidden house in the courtyard of a restaurant called Palma on Cornelia Street, if you're ever in the neighborhood.